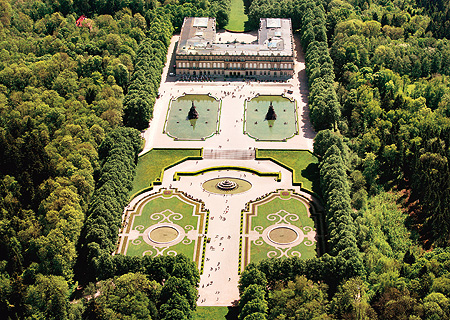 As with the New Palace of Herrenchiemsee, King Ludwig II wanted the park modelled on the Versailles complex without being an exact copy of it. The plans focused primarily on the areas that could be seen from the main rooms of the central palace tract – the State Bedroom and the Hall of Mirrors. The main parterre on the west side with hedges, geometrically shaped lawns and gravel ornamentation ends in a canal leading to the lake. 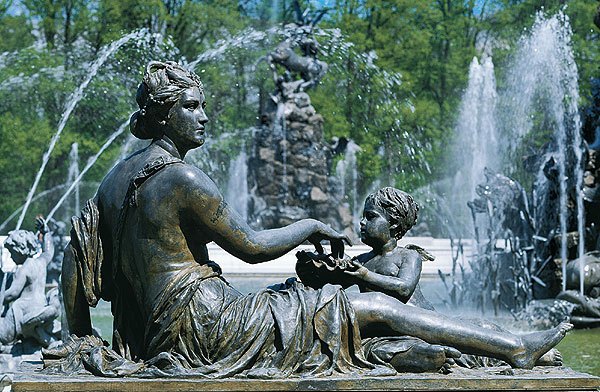 The Latona, Fama and Fortuna Fountains have been in operation again since 1994, following comprehensive renovation. It takes around two hours to walk round the 230-hectare island, which was turned into a natural park. The path is bordered by dense woodland, meadows with grazing animals and orchards and there are splendid views of the Alps. At the northernmost tip of the island is the Lake Chapel of the Holy Cross dating from the 17th century, which is easily accessible from the boat pier.